Ben Ripley is back — and he’s going undercover. 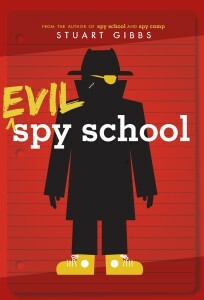 On the first day of the new year at spy school, thirteen-year-old Ben Ripley accidentally shoots a live mortar into the principal’s office—and gets himself expelled. But when SPYDER shows up shortly afterward, offering him a position in their evil organization, he begins to suspect he’s been set up for a mission. So he accepts. As a new student in SPYDER’s evil spy school, which trains kids to become bad guys with classes like Counter Counterespionage and Laying Low 101, Ben does some secret spying of his own. He’s acting as unofficial undercover agent, and it becomes quickly apparent that SPYDER is planning something very big—and very evil. Ben can tell he’s a key part of the plan, but he’s not quite sure what the plan is. Can Ben figure out what SPYDER is up to—and get word to the good guys without getting caught—before it’s too late?